A subsidiary of KPC with operations focusing on the downstream sector, KNPC is Kuwait’s only Refining Company. They provide the local market with all Fuel needs, including Gasoline, Diesel, Kerosene and Gas. These and other products are also catered towards the international markets. 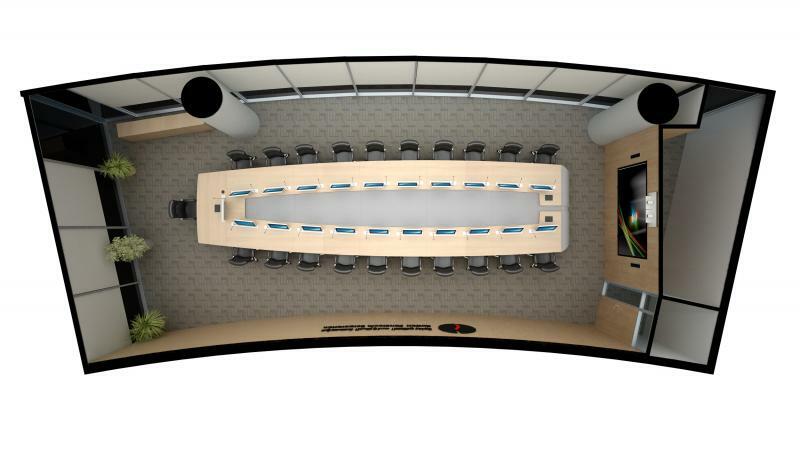 Roomdimensions Ibérica (RDI) has developed a huge meeting table equipped for 21 users. 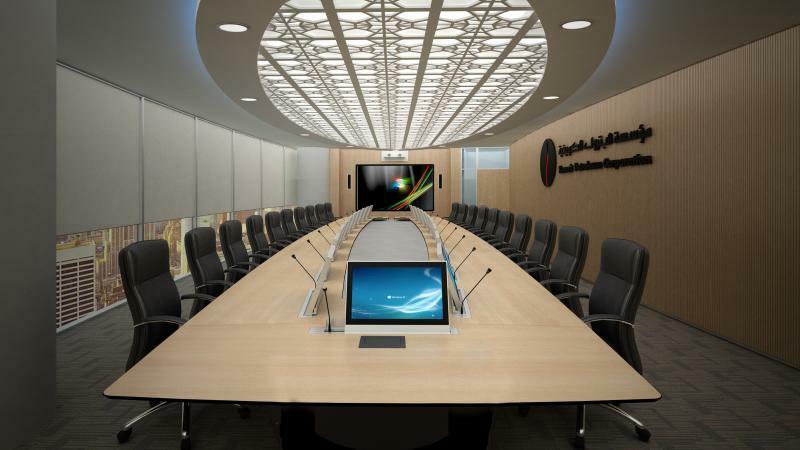 Every work post is fully furnished with the most technological equipment to guarantee a comfortable and easy meeting. Foldable monitor Every work post counts with a retractable motorized 21,5" monitor and a microphone. The resolution of the screen is 1920x1080 with anodized aluminium housing and protective glass. 20º tilt adjustment at user choice. Connectivity unit in a retractable monitor Microphone connector in the left side of the retractable monitor and a USB connector. They are visible when the monitor is open. Extron unit The extra connectivity is located at the end of the console, in the last position of the operator. Cabling distribution Structural trays all along the console bottom allow to pick the cabling from every work post and drive it to any other place inside the structure uninterrupted. Center space There is extra space in the centre of the desk structure to store the electronic equipment. The access to the centre space can be limited by the size of the monitor and/or microphone. Depending on the equipment to install, measures per operator of the desk may vary. Management and accessibility All the structure is communicated so the cabling can go through the work posts uninterrupted. 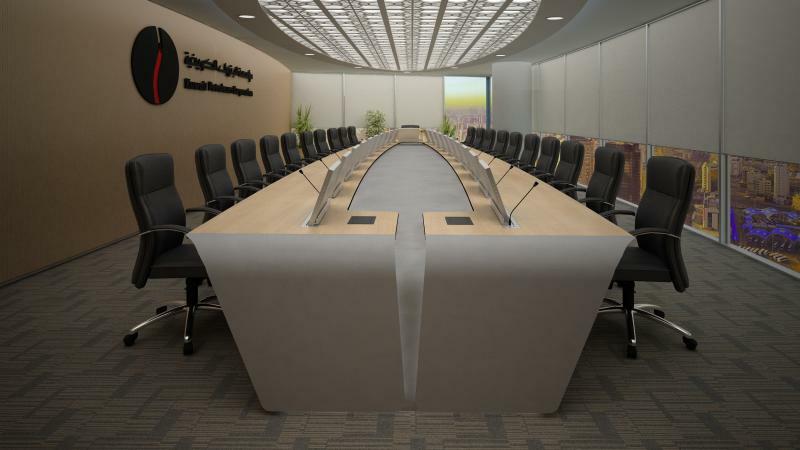 It is accessible through the covers located on the front part of the desk. Space inside the structure The space left inside the structure after placing the monitor case and the connectivity spot is divided into 2 zones with trays to drive the cabling or small equipment. 21 executive chairs All the set is completed with 21 executive Khroma chairs full leather. A premium, affordably priced executive chair that combines ergonomic support with a plush appearance and exceptional styling. An ergonomically contoured back plus a generous seat equals superior comfort. 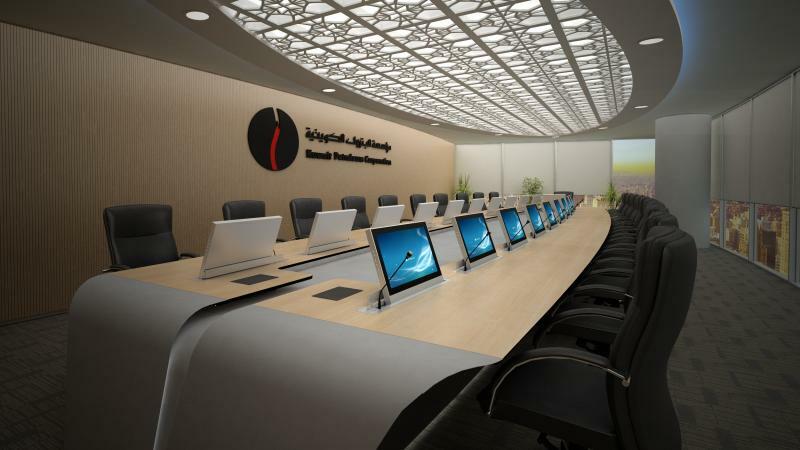 All the set is completed with 21 executive Khroma chairs full leather. A premium, affordably priced executive chair that combines ergonomic support with a plush appearance and exceptional styling. 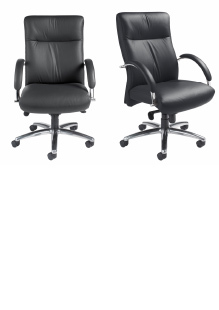 An ergonomically contoured back plus a generous seat equals superior comfort.